You’ll be surprised to know that there are so many interesting facts about your signature. It can reveal the most important features of your personality, which you couldn’t even imagine before. I think that handwriting analysis is really a fantastic subject to study and speak about. By learning it you’ll be able to see unusual and unique things in everyone. Pay more attention to your signature and you’ll discover some astonishing things about yourself. You should know that the location of your signature on the page really matters. Those people who tend to look forward in life usually put their signature to the right. If your signature is in the center of the page that means you lack attention of other people or maybe you just want to emphasize your importance. Do you place your signature on the left side of the page? Certainly you are too much concentrated on your past. Such location of your signature can also show that you are withdrawn. The size of your letters is one of those things that are worth mentioning. Considering it, you can find out some new information about yourself. It is believed that shy, meticulous and withdrawn people mostly use small letters in their handwriting. Average letters characterize adaptable and well-adjusted individualities. Those who like to be in the spotlight will always use large letters. Or you might be an outspoken and outgoing person. This is also a great sign of your confidence. Lots of people give preference to a fancy signature. For example, some time ago I signed the letter “i” with a heart on top. I should say that embellishments used in your signature can describe the inner sides of your personality. Are there any lines going through your signature? That is the sure sign of your self-criticism. I know some people who like to underline their names. In such way they generally express their high status and importance. It is necessary to mention that the circle drawn around your signature reveals your desire to be protected. Every time when I read illegible handwritings I feel a great discomfort. Recently I have learnt that the majority of arrogant people use an illegible signature. They don’t want to spend time making their letters clear for others as they think that a reader knows them well. Legible signature usually represents honest and open personalities who are satisfied with their life. Such people don’t hide anything from those who surround them. How often do we focus on the content of our signature? Some signatures may consist of the first initial which is typically followed by the first part of a person’s last name. Those people who prefer to use only their second name for the signature are thought to be formal and reserved. You can choose to write your full name either. That means your attitude to life is more relaxed. It is necessary to mention that these two letters can tell you some unknown things about character. Do you know that there a lot of ways to dot the letter “i”? People with a great imagination will always dot high. If you dot on the left, you are definitely a kind of person who spends much time for doing various things. A dot over the “i” is a clear sign of disciplined and organized personality. A circled dot shows that you are childish or dreamy. What about your Ts? If you feel confident about yourself, your letters will be crossed in the center. I have noticed that all lazy people tend to put short crosses. In contrast to this, long crosses reveal stubborn and enthusiastic people. Now, let’s look at the direction of your signature. This aspect is pretty easy to analyze. When you see a signature with a slant to the right you can be sure that its owner is sociable and friendly person. The signature slanted to the left shows us modest people who don’t like to push themselves forward. The next point which should be considered when speaking about your signature is the shape of the letters. They can be either pointed or round. Round letters are often used by artistic and creative personalities. In case you have pointed letters, surely you are very clever. However, sometimes you can be aggressive. Some of us like to press hard when writing the letters. Such peculiarity of your signature shows you as a serious person. You work hard to improve yourself and to achieve your goals. But when the pressure is too heavy, people are considered to be uptight. If your preference is light pressure, you are quite sensitive and vulnerable personality. Besides, that is the sign of your pessimism and stolidity. 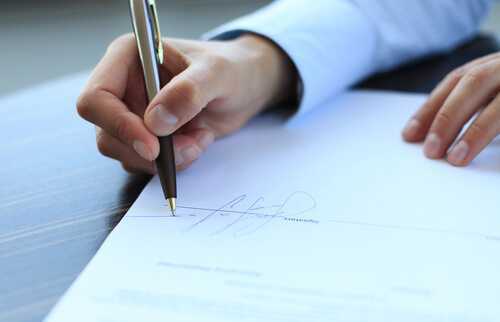 Consider these interesting things while analyzing your signature and you will certainly have much fun. There are some people who try to alter their character using different handwriting. What do you think about this? Give your opinion, please.